$36,400 x 96 Months @ 4.29% APR (estimated financing rate, cost of borrowing $7,429). $0 down payment. Taxes included. Impressive attention to detail makes up the all new Jeep Compass. From the first look inside this amazing SUV, you'll know that you're surrounded in greatness. 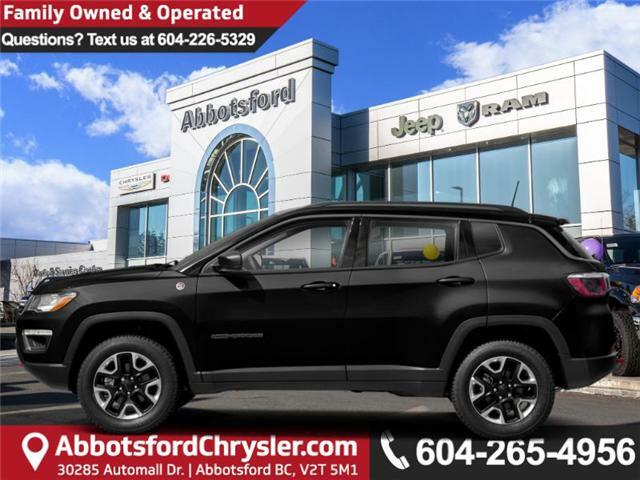 With stunning interior and exterior finishes and a convenient driver experience, this all new Jeep Compass is ready to tackle whatever you put in front of it. This ground up re-design integrated the modern world with all of the latest safety and technology. This diamond black crystal p/c SUV has a 9 speed auto transmission and is powered by a 180HP 2.4L 4 Cylinder Engine. Our Compass's trim level is Trailhawk. This 4x4 Trailhawk is equipped with skid plate protection, increased ground clearance, and signature front and rear Ruby Red tow hooks. This strong and attractive SUV stands apart from all others, with a unique front and rear fascia, a black roof and a black anti-glare hood decal. This amazing SUV also comes with leather-faced seats with Ombré mesh inserts and ruby ded accent stitching, a larger 8.4 inch colour touch screen that includes Jeeps new UConnect 4 media system, dual zone climate control, Parkview rear backup camera and so much more. This vehicle has been upgraded with the following features: Leather Seats, Heated Seats. To view and download a brochure open this url https://www.jeep.ca/en_dir/pdf/2019/brochures/compass.pdf. View the original window sticker for this vehicle with this url http://www.chrysler.com/hostd/windowsticker/getWindowStickerPdf.do?vin=3C4NJDDBXKT704251. Total rebate of $4044 is reflected in the price. Credit includes up to 10% of MSRP Discount. 4.29% financing for 96 months. Buy this vehicle now for the lowest bi-weekly payment of $231.71 with $0 down for 96 months @ 4.29% APR O.A.C. ( taxes included, Plus applicable fees ). Incentives expire 2019-04-30. See dealer for details. * Every reasonable effort is made to ensure the accuracy of the information listed above. Vehicle pricing, incentives, options (including standard equipment), and technical specifications listed is for the 2019 Jeep Compass Trailhawk may not match the exact vehicle displayed. Please confirm with a sales representative the accuracy of this information.